Do you crave to jitterbug in a haven for hepcats? Maybe you’d rather polish up your winklepickers and hit the floor for some jive with your poodle-skirted honey? 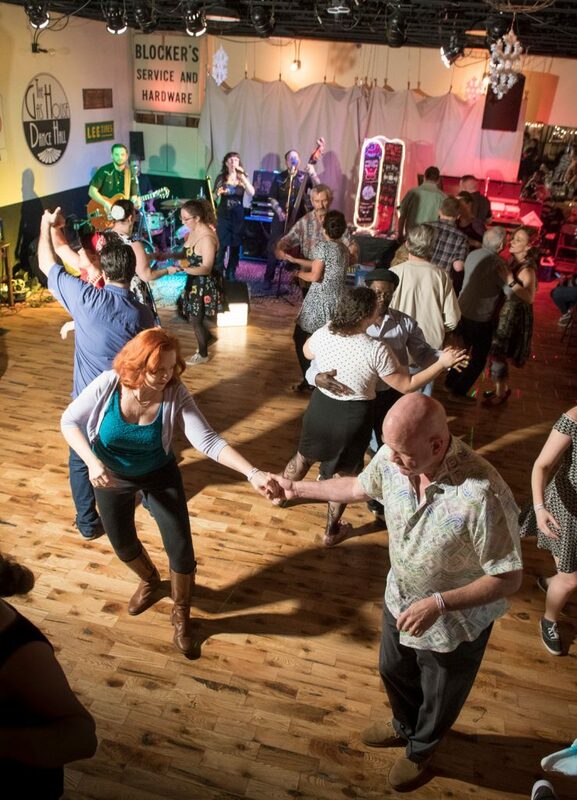 You can do both—and lots more—when you drop by the Gas House Dance Hall, one of the most hoppin’ joints in the Lehigh Valley. 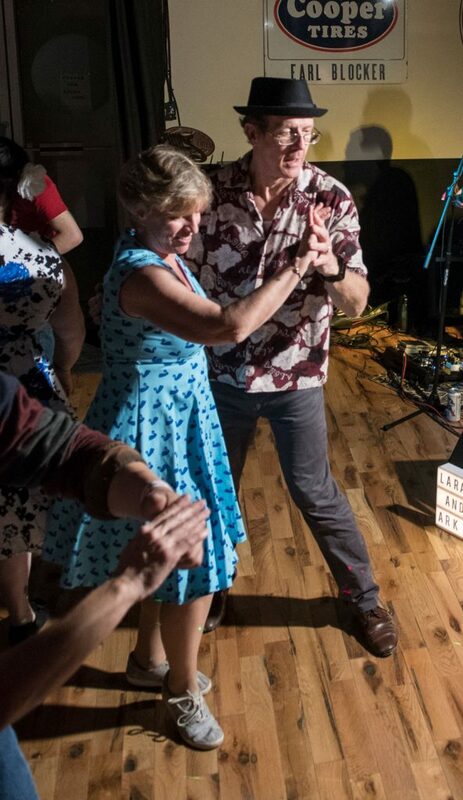 Swing dance enthusiasts Robynn and Keith Shannon founded the Gas House in 2013. 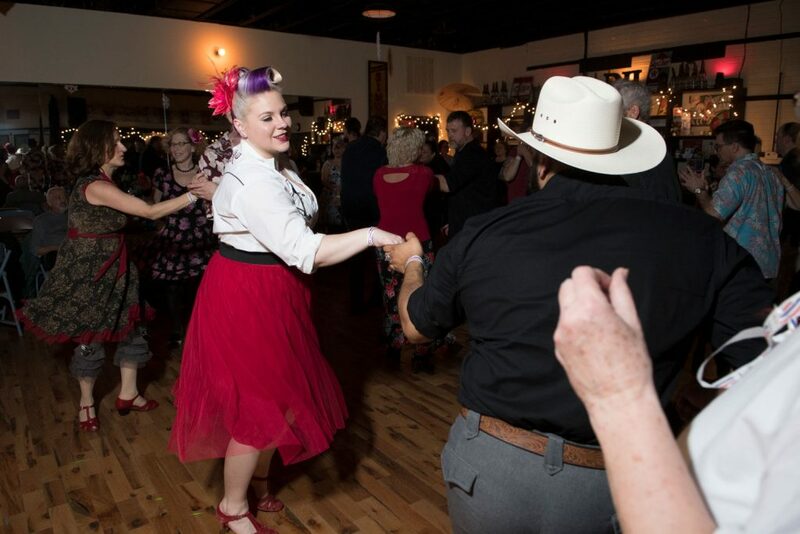 “They took a run-down former Texaco gas station on Front Street in Catasauqua and turned it into a real destination for the swing dance community,” says manager Vicki Bartholomew. 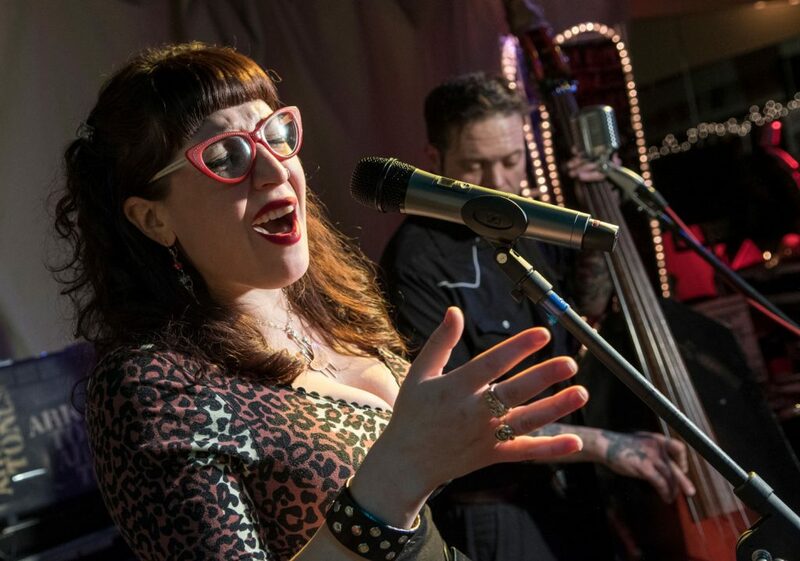 After major renovations to the former Blocker’s Service and Hardware building, the duo offered classes in a variety of styles: vintage East Coast swing, West Coast swing, belly dancing, and even burlesque. They regularly held dance socials, offered practice space for dancers, and booked swing and rockabilly performers. 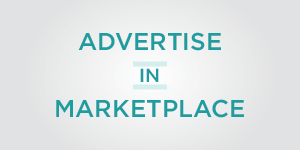 But when their day-job responsibilities took them to Europe, the Shannons sold their business to Vincent Smith, Catasauqua Borough Council President and Vicki’s brother, who already owned the physical property. Swing fans need not fear: Vicki says they’ll stay true to the original Gas House vision. 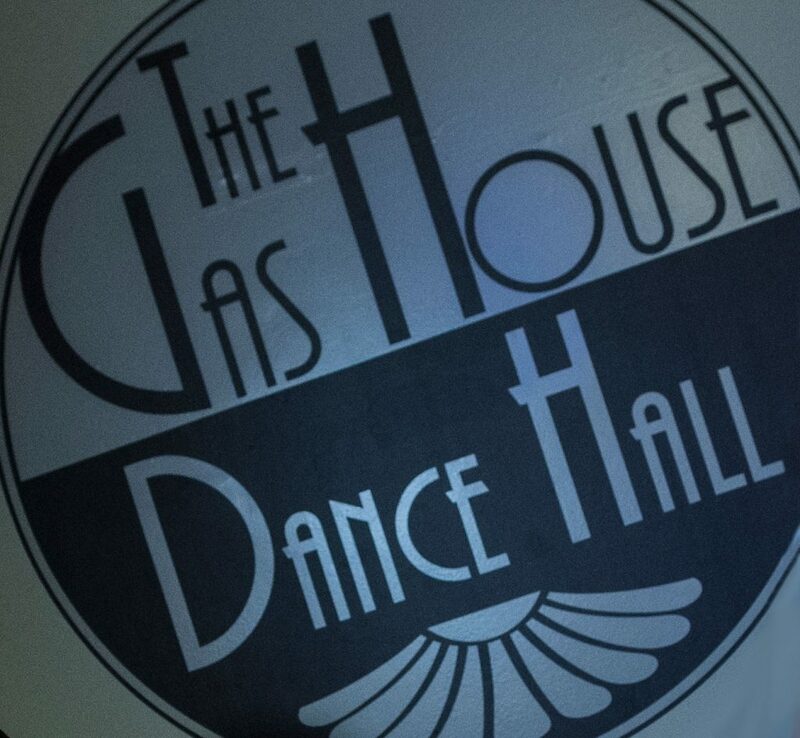 Whether you’re an aspiring dancer or one who wants to “level up,” the Gas House should be your destination. “Two nights a week, we offer beginner and advanced classes in vintage swing dancing, also called East Coast swing,” Vicki says. (That covers such classic dances as the Jitterbug, Charleston, Lindy Hop, Balboa, Collegiate Shag, and Jive, and is taught in six-week sessions.) After a one-week break, a new session starts. Wednesday nights are devoted to West Coast swing. What’s the difference? “West Coast is based on the same steps and moves as East Coast, but adds little extras to give dancers more flexibility— it’s not as strict,” Vicki says. Local dance instructor Eric Bass also teaches salsa and bachata on Tuesday nights. Mention belly dancing and many people think of women seductively twirling and spinning. But at the Gas House, belly dancing represents the expression of female empowerment through performance dance. It’s also good exercise: non-impact, non-weight-bearing, and suitable for all ages. 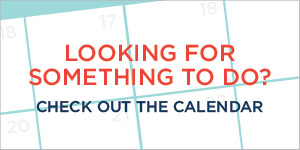 Sessions last six to eight weeks, and are taught in a very body-positive atmosphere. The Gas House doesn’t hide its service-station roots. “We have lots of stuff from the original building,” Vicki says. Vintage signs proclaim the availability of “Fire Chief” gasoline (one of Texaco’s now-defunct brands), and old motor oil bottles (yup, bottles!) complete with screw-on pouring spouts are scattered about. There’s a still-working illuminated gas pump globe, “and we have a Texaco hat that was a station giveaway in the 1940s,” she adds. But the oil-stained concrete floor is long gone. 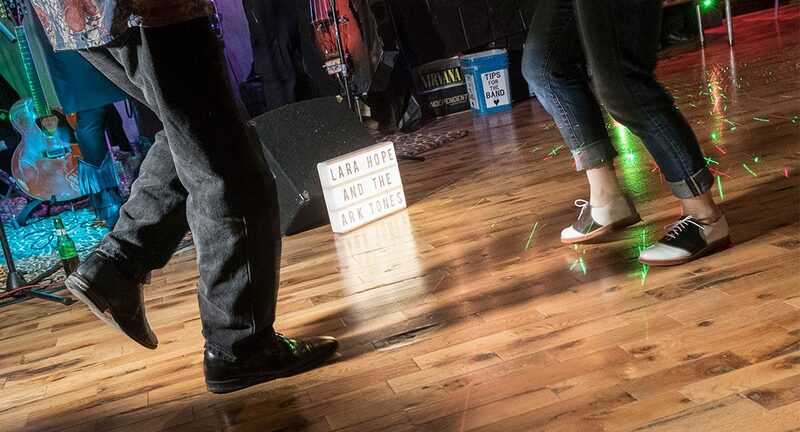 In its place is a custom-installed hardwood dance floor that Vicki describes as “the best swing-dance floor in the Lehigh Valley.” Ordinary flooring can batter dancers’ feet and joints, but the Gas House’s sprung oak floor is much more forgiving. With “sprung” floors, the hardwood top layer is cushioned by foam backing or rubber feet. It’s sort of like dancing on a giant shock absorber: because the floor “gives” a bit on impact, there’s less stress on your joints. The hall sports two full walls of floor-to-ceiling mirrors, strings and strings of ambient lighting, about a dozen dimmable overhead lamps, and a floor-level space that’s reserved for the stripped-down, high-energy bands that perform at the regularly scheduled dance socials: Lara Hope and the Ark-Tones, the Rock-A-Sonics, Dibbs Preston and the Detonators, and the Crescent City Maulers, to name just a few. Blocker’s Coffeehouse opened in the same building last June, and has become a key part of the Gas House scene. “It’s open all night, with many kinds of fair-trade coffees, espresso, mixers, and snacks. Our swing dancers love the idea, because they can get a little energy boost from the caffeine,” Vicki says.